We’d love your help. Let us know what’s wrong with this preview of Book of Roots by S.T. Holmes. Mardi Gras in New Orleans is the perfect locale for a treasure hunt. When it coincides in the year of the Luperci festival, the magic world is turned upside down, and the feast of forgiveness turns into a fight of wickedness. This Mardi Gras festival is like non ever seen before or will ever see in the future. Experience sibling rivalry at its finest as two sisters square o Mardi Gras in New Orleans is the perfect locale for a treasure hunt. When it coincides in the year of the Luperci festival, the magic world is turned upside down, and the feast of forgiveness turns into a fight of wickedness. This Mardi Gras festival is like non ever seen before or will ever see in the future. To ask other readers questions about Book of Roots, please sign up. 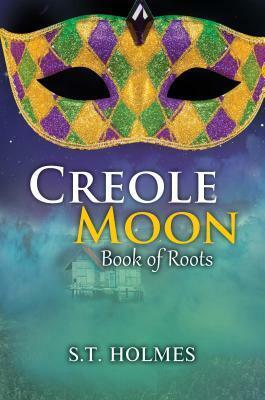 “Creole Moon: Book of Roots” earns 5/5 Wings of a Wood Nymph…Glorious Fun! I have stepped out of my “cozy” zone choosing to read the second book in the Creole Moon series “Book of Roots,” a fantasy gem by S. T. Holmes. I worried I would be handicapped by not having read the first book, “The Betrayal,” but Holmes provided enough references to background and character connections to keep me engaged. It will be necessary to read book one because how the characters came to this point in their adventu “Creole Moon: Book of Roots” earns 5/5 Wings of a Wood Nymph…Glorious Fun! I have stepped out of my “cozy” zone choosing to read the second book in the Creole Moon series “Book of Roots,” a fantasy gem by S. T. Holmes. I worried I would be handicapped by not having read the first book, “The Betrayal,” but Holmes provided enough references to background and character connections to keep me engaged. It will be necessary to read book one because how the characters came to this point in their adventure undoubtedly is just as entertaining. The fascinating premise of “Book of Roots” starts with Mamuska, the voodoo priest of the swamp, and his wife Ophelia who last visited their earthly home in the Louisiana bayou one hundred years ago. He is eager to join others during the century creole moon, this time during Mardi Gras, and take advantage of its heightened magic to rejuvenate, more accurately possess another soul. However, he has been told by his mother and goddess of the demi gods that his wife Ophelia does not have her permission to join him. Mamuska needs her and finds a way to bring his love with him. Excellent beginning to this fantasy. Even though there own journey adds the evil to the adventure, Holmes gives them a level of humanity, however dark. Next, whisked to Louisiana 1925 just days before Mardi Gras, we meet our protagonist George Genois, within him a Luxican light beast, who has spent a hundred years in the swamp, and today he senses a change. He comes upon a wood nymph Airie that directs him to Marie Toussant. After he witnesses her transformation from old crone to a young woman, she provides some details about his role in the Prophecy of Luperci, and her desperation to locate the Book of Roots. The text holds the key to leavening her revenge against her sister and reversing broken magic, but it also holds the remedy to relieve George of his own Luxican curse, possibly return his love Jewella, and allow him to live once again as a human. These paths seeking their own end can only collide with the demi-gods who refuse to relinquish their power. So as Mardi Gras begins, so does the search! But, wait, it isn't that easy. They are not the only ones who seek the book of roots, and the fate of their world hangs precariously in the balance. Wow! I was hooked, and with less than 200 pages, I couldn't put the book down all weekend. It is Mardi Gras in New Orleans and the year of the Luperci festival, a time for forgiveness in the magic world. Mamuska, a voodoo priest wishes to return to the mortal world to find a new body to inhabit for his ritual of renewing. He wishes to take his wife Ophelia with him, but the serpent goddess, Ayida, forbids him to do so. She sees a darkness within Ophelia that hints at danger and instability. Mamuska is reluctant to tell his wife of this decree by the goddess, so he doesn't and takes he It is Mardi Gras in New Orleans and the year of the Luperci festival, a time for forgiveness in the magic world. Mamuska, a voodoo priest wishes to return to the mortal world to find a new body to inhabit for his ritual of renewing. He wishes to take his wife Ophelia with him, but the serpent goddess, Ayida, forbids him to do so. She sees a darkness within Ophelia that hints at danger and instability. Mamuska is reluctant to tell his wife of this decree by the goddess, so he doesn't and takes her with him. Returning to the swamp, their old home, he begins the process of searching what it is that he needs. While he is on his quest for power and renewal, George Genois is out with his alter being inside, for revenge. He remembers the pain and suffering that he endured at the hands of Ophelia and his alter being wants payback. He is taken in by an old woman who seeks his help with her own quest. She is looking for the other half of a book that she lost long ago. She wishes to right a wrong was done to her, and to break free of the predicament that she has found herself in. She knows that it will not be an easy task ahead of her. The clock is ticking as she seeks the book of roots. She must find it before her sister, who is evil, finds it. Can they succeed in what it is they quest for or will the world be lost to evil? Creole Moon: Book of Roots by S.T. Holmes is a dark fantasy novel full of magic, priests, gods and goddesses, and a desire to be free. This is the first book that I have read by this author. When I started reading this book I had no idea that it was book two in a series. While I do feel that there are some parts and things that I am missing from not reading book one first, this book is an enjoyable story to read. The characters are interesting, and for a minute it is a bit tough to fully grasp what is going on, but once you get into the flow of the story it really engages you in. I like that the author gives us the backstory on Sephora and her evil sister. For me, this is one the most engaging parts of the story. It's interesting to read about the jealousy of one and the complete love of another. The backstory truly helps to set the stage and explain how things came to be between the two sisters, and why the story is going in the direction that it is. While I enjoyed this story, I still feel that there were some elements that I missed out on from not reading the first book first. Plus, this book could use someone going over with a fine tooth comb to catch the editorial errors that are throughout. There are spelling errors, and a few minor editorial issues as well. Despite these minor issues, the book is good. None of these issues are to the point that they will distract or detract from the overall story itself. Just like most of us have, I'm always a little apprehensive about the second book in a series. Sometimes the book meets your expectations, sometimes it’s just super flimsy and you just want to pretend that it never occurred. That’s the worst that could happen. However, I had high hopes for this book because I had to dig the first one. It didn’t disappoint. Book of Roots is the second book in the Creole Moon series. It is perspicuous that the events of the prior book would add to a reader's grasp a Just like most of us have, I'm always a little apprehensive about the second book in a series. Sometimes the book meets your expectations, sometimes it’s just super flimsy and you just want to pretend that it never occurred. That’s the worst that could happen. Book of Roots is the second book in the Creole Moon series. It is perspicuous that the events of the prior book would add to a reader's grasp and assimilation of what came before. But this author bestowed any enlightenment the reader would entail to revel in this as a standalone story with ease. I really had a whale of time with the treasure hunt feature of this book. With an engrossing setting in New Orleans, the plot follows a feud between two sisters, Mamuska and Ophelia. Filled with obscurity, mystique, and vengeance, it doesn't get more exciting than that! I was attained from the preamble of this story by the author’s exceptional artistry in constructing sets. The readers will feel allured and drawn for sure. The storyline is fiddly done and readers will be anxious and be dying to find out what happens to the characters as they follow the vigorous drama. It was the year of the creole moon, the time of year best for beings of magic to regenerate and recharge. This time however, it fell in line with a festival, and a prophecy. Long ago this prophecy was woven, the prophecy of the Luperci, and already the signs are there to see. A priest had placed a hex on all magic, and events suggest its end is nigh. If there is any hope to save magic the book of roots must be found before the Mardi Gras day ends. This is the only chance to reverse this spell, i It was the year of the creole moon, the time of year best for beings of magic to regenerate and recharge. This time however, it fell in line with a festival, and a prophecy. Long ago this prophecy was woven, the prophecy of the Luperci, and already the signs are there to see. A priest had placed a hex on all magic, and events suggest its end is nigh. If there is any hope to save magic the book of roots must be found before the Mardi Gras day ends. This is the only chance to reverse this spell, if they fail all will be lost. Clues litter the path, guiding the way. There are two who seek to possess the book, those of good, and those of evil. Old enemies surface stirring thoughts of revenge amidst what will prove to be the most spectacular festival ever seen. Book of Roots is the second book in the Creole Moon series, and whilst it is clear that the events of the previous book would add to a reader's understanding of what came before, S.T. Holmes easily supplies any information the reader would need to enjoy this as a standalone book. I really enjoyed the treasure hunt quest aspect of this book. Filled with magic, mystery, adversary, revenge, schemes, and a ticking clock counting down to disaster, it doesn't get more griping than that! This is a book filled with atmosphere, you can really picture yourself amidst the bustling streets, or hunting down the next part of the riddle. The ultimate sibling rivalry with the highest imaginable stakes and a side helping of revenge, all presented in a well written and engrossing manner, addressing the internal and external struggles of all the characters involved. An interesting and creative story that flowed quite nicely. At first your not to sure if you want to stick with it, but give it a chance, it'll surprise you and you just might like it a lot. so when you get a chance pick up a copy and enjoy.